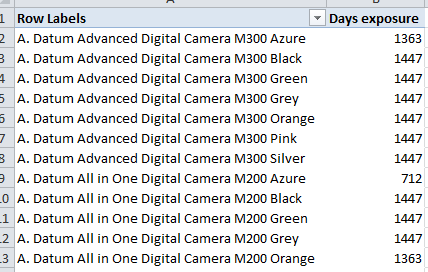 One of the most important things you need to know about PowerPivot and DAX is row and column context. Creating measures become a lot easier once you understand it. So if a product was first distributed on January 2009, MonthsExposure would be 24, etc. Let’s take a look a what this means for the value in the red circled cell. This cell contains the sum of all the values of the field onorderquantity in the fact table for that specific country (China) for the year (2008). This means this is not just one value but is a set of values that is summed up to get one value. The measure makes sure we summarize it. Back to the example of the question from my blog. He wanted to have the first date a specific product was sold. Remember that by putting the Products on rows we create a filter of all the rows by that product for the measure that we put in the values. 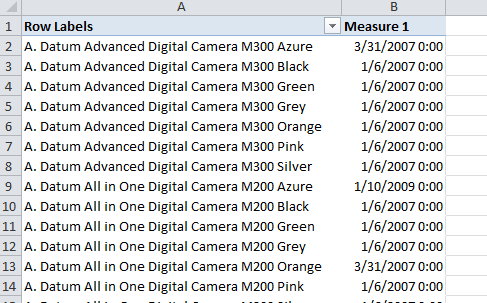 The measure must be an aggregation, the filter returns a lot of rows. In this case we want the first date a product ever was sold, This fact is captured in the field: FactInventory[DateKey]. This returns the first date that a product was sold. 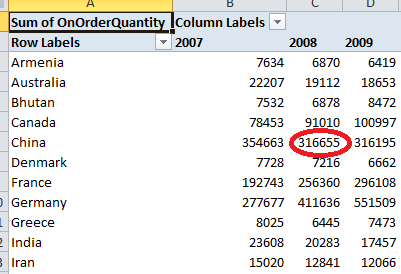 I hope this blog post got you thinking about Row and filter context in PowerPivot. It really simplifies building measures if you understand it. 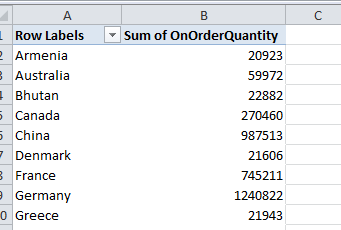 DAX (Data Analysis Expressions) is a new expression language for end users to add business logic to their PowerPivot applications. 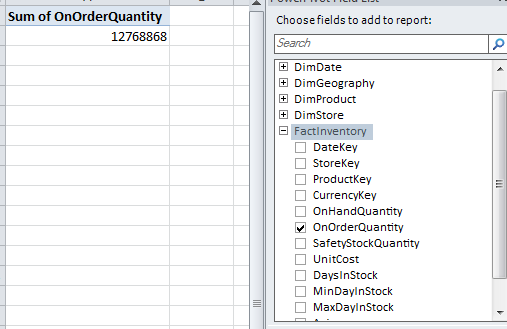 DAX offers a lot of power and flexibility while retaining the the simplicity and familiarity of Excel like formulas. This session explains the fundamentals and concepts behind DAX and demonstrates how to add business logic in PowerPivot using calculated columns and measures. This session also introduces you to various categories of DAX functions — scalar functions, table functions, aggregates, time intelligence — but is not intended to be a comprehensive overview.